The BBTD Alliance partners – Bioversity, CIRAD and IITA – have organized a training course on ‘Banana virus diagnostics for clean seed production, safe germplasm exchange and surveillance of invasive bunchy top disease’ with a purpose to help develop diagnostics capacity of national systems in Africa. The course was held on 15 to 24 July at CIRAD Campus International de Baillarguet, Montpellier, France. The training course was organized as part of the research project “Banana bunchy top disease containment and recovery: Building capacity and piloting field recovery approaches through a learning alliance” financed by the CGIAR Research Program on Roots, Tubers and Bananas (RTB). Viruses pose a major threat to banana cultivation worldwide, particularly the Banana bunchy top virus (BBTV). This virus is now established in 13 countries in sub-Saharan Africa causing devastating production losses. In addition to BBTV, Banana bract mosaic virus (BBrMV) and Banana streak viruses (BSV) also have high economic significance. All these viruses are transmitted through vegetative propagation, including the production of suckers, corms, and tissue culture plants. Distribution of infected plantlets helps promote their large-scale dissemination. Detection of these viruses is critical to limiting their spread in areas where the viruses are endemic. Thus, diagnostic tools play a crucial role in monitoring viruses in the fields, in the production of virus-free plants, and during international exchange of germplasm. Many countries in sub-Saharan Africa do not have adequate capacity to diagnose banana viruses. Twenty participants from Burundi, Cameroon, Congo Brazzaville, Democratic Republic of Congo, Gabon, Malawi, Nigeria, and Republic of Benin, attended the course. The training course focused on the application of diagnostics to the production of clean planting materials, disease monitoring, and quarantine monitoring of germplasm to ensure safe germplasm exchanges. Co-organizers of this course, Dr Marie-Line Iskara-Caruna (Virologist at CIRAD who hosted the course) and Dr Lava Kumar (IITA virologist) said that participants were trained on the application of simple but advanced techniques to diagnose all known viruses of banana, including differentiation between infectious endogenous BSV and non-infectious ones and that this RTB- funded course helped impart knowledge to participants who can use the skills in their routine research as well as facilitate further training within their own countries. The organization of this event in Montpellier enabled working with exotic viruses such as Banana bract mosaic virus which is not present in Africa and is an important quarantine threat. 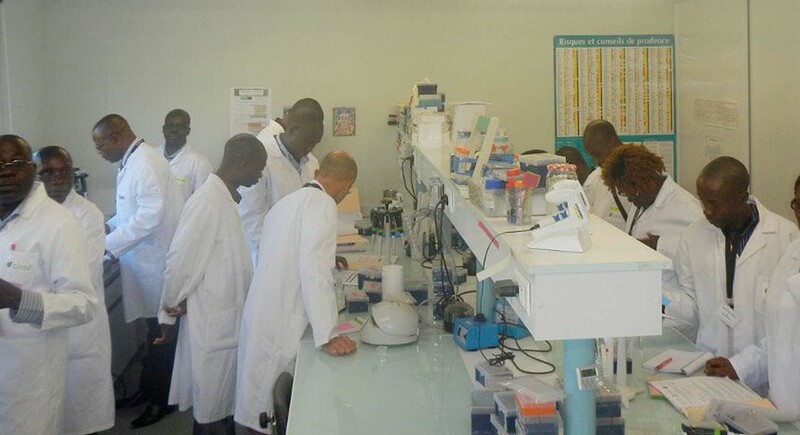 Laboratory exercises were organized for participants to assess the learning and also put this to use in the production of virus-free planting material in a session led by Dr Charles Staver of Bioversity International. Participants visited ‘Vitropic’ a banana tissue culture company based in Montpellier, which receives technical backstopping for virus indexing from CIRAD, to understand the best practices in production of virus-free planting material. “The course contributed to advancement of our understanding of diagnostics, interpreting the results and using it for decision making” said Dr Charles Onyeani, Head of the Post-entry Quarantine Station in Nigeria, one of the participants. The course concluded with distribution of certificates.